The greatest challenge in tracing the family history of our immigrant ancestors is identifying the name of the home town in the old country. The first place to start when searching for the home town is to talk to the elders in your family. Parents, grandparents and great grandparents will often have the clues that you need to discover your immigrant origins. I am currently working for two sisters that are planning a trip to Italy with their parents. Their immigrant ancestors were Marco Oliva and Catherine Graffigna who met and were married in New Orleans in 1862. Locating the home town of Pre-Civil War immigrants can be especially challenging. Fortunately, Marco and Catherine Oliva had a daughter named Pauline that lived to be 109 years old. 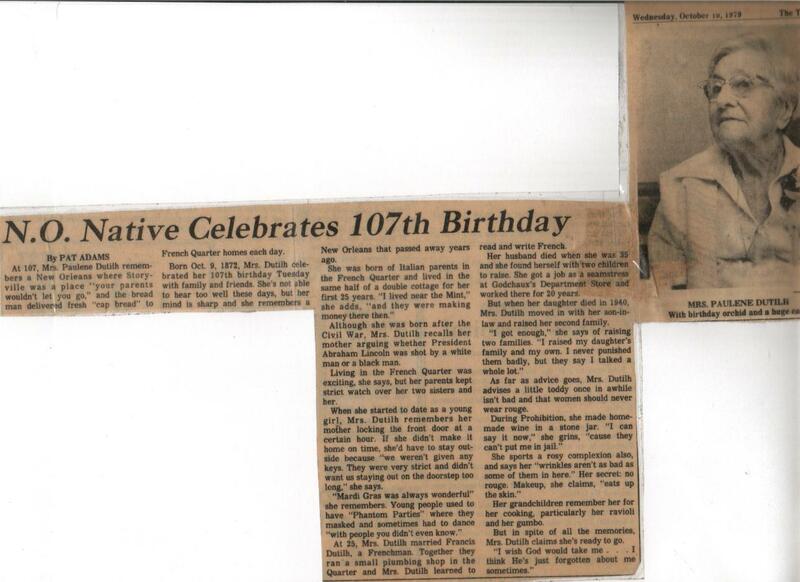 This newspaper clipping was found at US Genweb site. A hundred years of living adds up to a lot of memories, both happy and sad, and Mrs. Pauline Oliva Dutilh, who reached the century mark Monday, doesn't dwell on the sad ones. And perhaps that is the real secret of her longevity. In fact, her sense of humor and good health belie her years. Her only complaint is, "I do not hear so well anymore." Mrs. Dutilh, who was born in New Orleans October 9, 1872, lives in Metairie with her son-in-law, William Louis Mayer. She does the housework, with occasional help for the heavy cleaning and the cooking. According to Mrs. Dorothy Mayer Shall, a granddaughter, Mrs. Dutilh is quite a cook. "We may cook the same dishes, but even the children can tell the difference. Ma Ma just does something a little differently." She also does her own grocery shopping. Once a week Mrs. Shall calls for Ma Ma in her daughter's low slung sports car for a trip to the market, an outing Mrs. Dutilh looks forward to. Mrs. Dutilh was the youngest of three daughters of Marco and Catherine Graffigna Oliva who were married in St. Louis Cathedral where she was later christened and made her first communion. Both were from families of cheese-makers, he from Genoa, she from the Italian Alps, and Mrs. Dutilh recalls stories her father told of storing cheese in caves near his boyhood home in Italy. Her family spoke Genoese at home, a lanquage Mrs. Dutilh finds most beautiful. She learned French from the Marianite nuns at "Sisters school" on Hospital street, which she explained, is now Govenor Nicholls Street. Mrs. Dutilh said, "I've always liked lanquages." And she had an aptitude for them. She learned German and Spanish, too. She also attended McDonogh #15 school, which was near the family's home on Barracks street near Chartres, and St. Mary's Italian Church. As a child she recalls rolling a hoop around the block and playing "ring around the rosie." 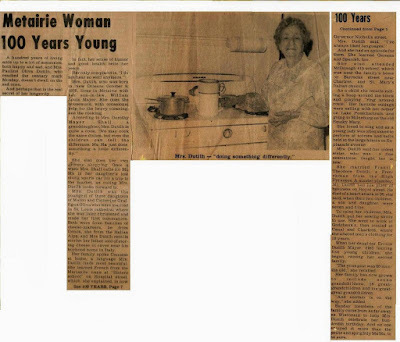 Her favorite outings were sailing with her father on Lake Ponchartrain and going to Milneburg on the old Smoky Mary. She loved to sing and as a young lady was often asked to perform at soirees and balls held in the large homes on Esplanade avenue. Mrs. Dutilh said her oldest sister, who was a fine seamstress, taught her to sew. She married Francis Theodore Dutilh, a Frenchman from the High Pyranees. A master plumber, Mr. Dutilh had his place of business on Royal Street. He died of a heart attack at 36, she said when their two children, a son and daughter were seven and nine. To raise her children, Mrs. Dutilh put her sewing skills to use. 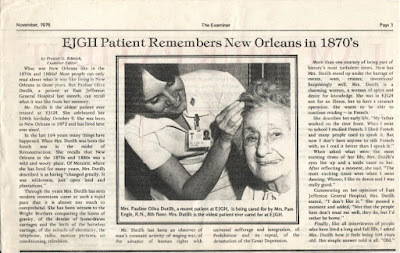 She went to work at Godchaux's then located at Canal and Chartres where she altered men's clothing for 12 years. When her daughter, Ercilia Dutilh Mayer, died leaving five young children she began raising her second family. "The youngest was 20 months old," she recalled. Her family has now grown to include seven grandchildren, 18 great grandchildren and six great-great grandchildren. "And another is on the way," she added. Sunday members of the family came from as far away as Wisconsin to help Mrs. Dutilh celebrate her hundredth birthday. And no one enjoyed it more than the petite and sprightly Ma Ma, to be sure. 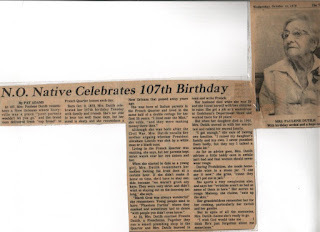 Newspapers have often published these types of human interest stories about centenarians. Searching for these interviews of ancient ancestors can have obvious benefits when searching for their origins. Even if your ancestors made it into their 80's or 90's, there may be articles like this available. 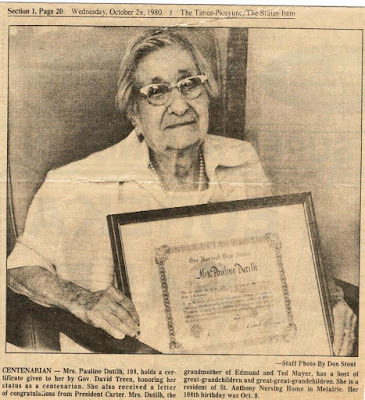 Mrs. Pauline Dutilh lived to 109 so there are several more articles that made it into the newspaper annals. I was incredibly lucky to have found all of these articles online. The volunteers of the US GenWeb have done an incredible service by placing these articles in their digital archives. If you have access to online newspapers you may also get lucky and find articles like these. 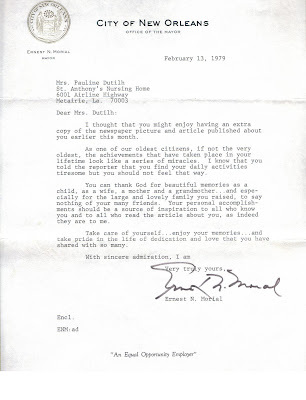 Newspapers often have archivists that can be helpful. Newspaper microfilm can be searched around the birth dates. 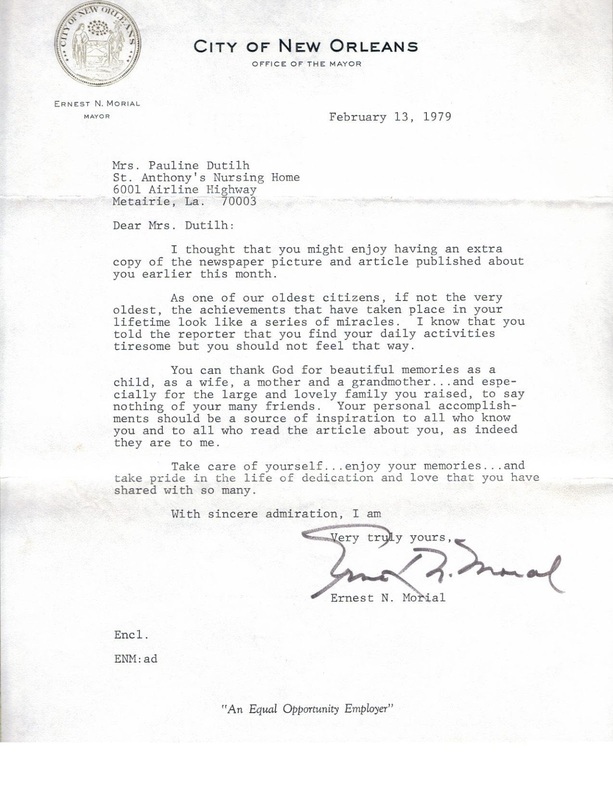 Local libraries and genealogical societies often have clipping files that can be accessed through an email, phone call or letter. The archives of the mayor or the governor might include information compiled for certificates or letters. We are still looking for more clues to pinpoint the parish and churches of Marco Oliva and Catherine Graffigna. These memories of cheese makers in the old country are priceless. We now have some clues that will help us get to the right neighborhood in Italy. This reunion has been facilitated by the memories of a centenarian.